In the spirit of Confession Friday (which I learned about thanks to the The Word Worm), I’ve decided to offer you some really great (read: the worst ever) pictures of my existence. In fact, if you enjoy them…let me know. I’m not short on “classy” photos of my chubby childhood. I could make this a fun Friday thing. Allow me to explain to non Catholics the basics of First Communion. In the 2nd grade, Catholic children, who’ve been guilted by their mothers since birth, make this right of passage into the church. This is when they start accepting communion (Jesus) into their bodies. Second grade was a really awkward time for me. Apparently, even though I had attended first grade CCD, 2nd grade was too full and Mom couldn’t enroll me in the class. 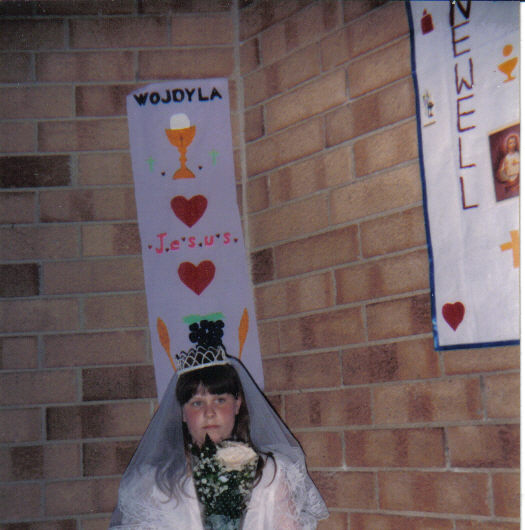 They told her that I could make my communion next year. Obviously, my very Catholic mother would have none of that. Soooo, she pulled a trick that only a woman in my family could pull. She pitched seven fits until the Director of CCD and Father Valente had to do something. They gave my mom the second grade CCD student and teacher books, and she “home-schooled” my religious education in the 2nd grade. Once a week, or every couple of weeks, we would sit down and go through the lessons in the book. Some weeks we would cover several lessons, other weeks just one lesson. Either way, this felt like a torturous experience for a severely awkward seven-year-old who really just wanted to go play with her friends. When it came time for Communion preparation, I had to do it all on my own (I mean, my parents were there and all–but no kids. No classmates. No peers.) So, the second grade teacher had made a cassette tape of the songs we would sing at the Communion Mass, that I practiced with. Mom and Dad took me to my First Confession. 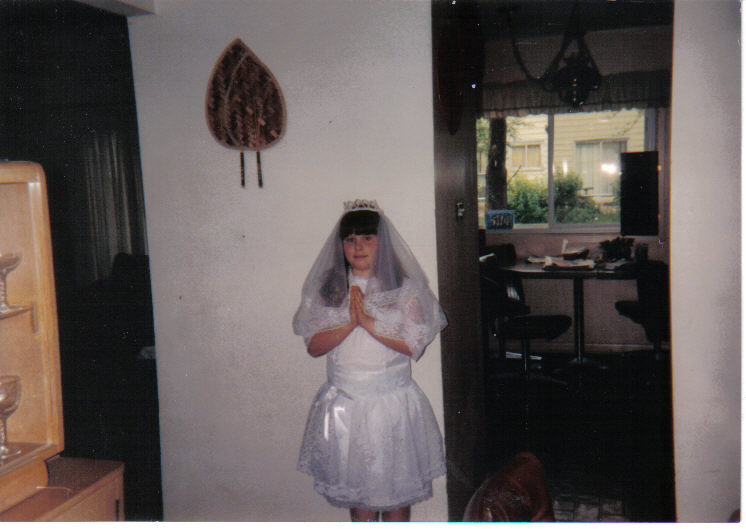 Mom and her best friend, Kathy, took me to get my First Communion dress. I got to pick out the dress and a veil. That part, I loved. Then came Communion practice. My first interaction with the other second graders. I knew some from school, and some from the previous year, but mostly they were strangers to me. To make an awkward child even more angsty, Mom informed me that I was not allowed to touch Jesus. This meant that while my peers would be taking the Communion into their hands, I would be taking it into my mouth. During practice, I was to test this out. I was so nervous and embarrassed for myself that I couldn’t see straight. The catechist running the practice looked at me a little funny when I didn’t have my hand reached out, because that’s not what he had explained…but he caught on quickly. Later, this would become, in my head, something kinda neat that I did during mass, and I was proud of it…but at the time, it was so embarrassing. Finally, the day of my Communion arrived. I barely remember the actual day. I know that I was there. I know that I made it through. I remember the priest who offered me Communion had an impressed look upon his face when he did not see my hands reaching toward him, but my open mouth. I remember that there was a party, and that was fun. 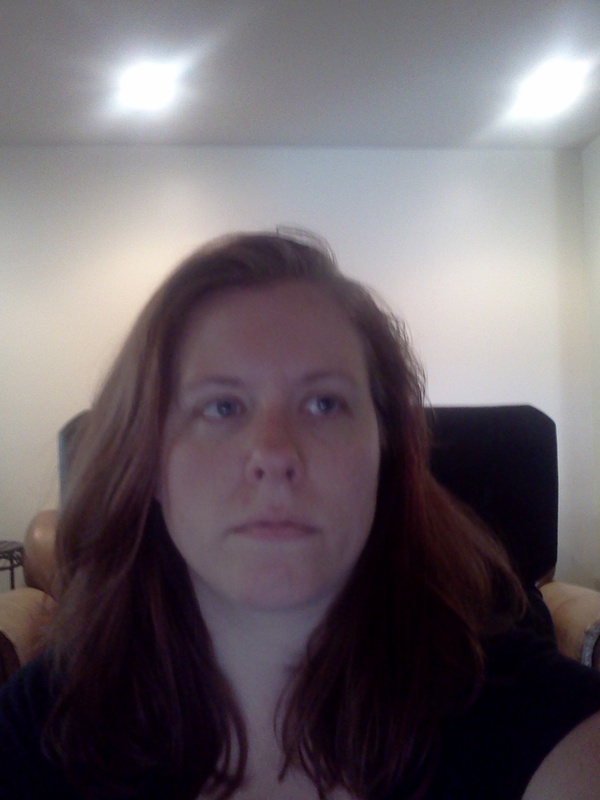 I took the liberty of attempting that surly look in my present… here’s what came out. And so now, my godson is on the cusp of his second grade year. About to make his First Communion. My mom actually taught him 1st grade CCD this summer so that he could sign up to be in the second grade class. He seems excited and interested. I think he’ll be a lot less awkward than his Auntie Chrissy. Thank God.